The Internationally acclaimed Quest Visual Theatre’s performance of “Fairytales & Other Nonsense” is a performance in search of an audience. 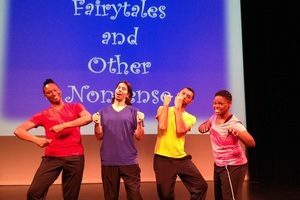 The performance on Saturday —its last in Baltimore before it hits the road — took a small audience at the Theatre Project on a journey through childhood stories and short skits with nonverbal communication and music. The program provides little clues about the nature of the performance, which was done entirely in mime. This is a medium traditionally associated with performers, who are deaf and hard of hearing. Those seeking an immersion into a cultural experience that combines American Sign Language with spoken English voiceover, will be disappointed. Those with small children may find it simply delightful. The program also provides little information about the talented performers in the Wings Company, beyond listing their names: Isafu Barrie, Minja Jung, Mervin Prrimeaux-Obryant and Diana Steinhauser and directed by Tim McCarty. The theater bill also could have provided a short synopsis of each mime, for those who over the years, may have forgotten the storyline of such fairytales of “Rapunzel” or who may be unfamiliar with it. The mimes themselves were very demanding of the viewer, and many of the performer’s movements describing the use of ordinary objects are lost on the viewer for lack of context, making the storyline somewhat difficult to follow. The performance might have better suited for street theatre than a stage. The performance opens with parents trying to sooth and settle their fussy infant in his crib at bedtime, but it is only later when the performers begin dancing that we realize that the gestures the performers were making were to turn on the music. The performance cuts away to the various fairytales, and perhaps the most successful is the whimsical “Laundromat.” This original mime takes a lighthearted look at a visit to a laundromat, and it is successful in its simplicity. We are familiar with the common movements and machines used to clean laundry, and can enjoy this new perspective. The show, which was about an hour, ended all too soon, leaving the audience wondering for a moment if perhaps there was a second act. The play ends with the actors inviting the audience on stage to dance. In entering this silent world of mime with deaf and hard of hearing performers, I left surprised when one a cast member spoke to me and thanked me for coming.